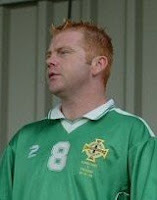 Representative Honours: Northern Ireland: 5 Under-21 Caps (1999). Club Honours: (with Palace) Southern Junior Floodlit Cup Winner 1996/97; (AFC Wimbledon) Combined Counties League Premier Division Champion 2003/04; Isthmian League Division One Champion 2004/05. Gareth Graham came through the Crystal Palace youth set-up. A battling midfielder who could also slot into defence as required, he was part of the Palace team that reached the semi-final of the FA Youth Cup in 1996 and won the Southern Junior Floodlit Cup the following season. He was just beginning to establish himself in the reserve team when a broken leg ruled him out for a lengthy period. He recovered to make his firstteam debut against Watford in April 1999, but many felt he had lost his pre-injury dynamism and he was allowed to join Brentfoed in 1999. He spent two seasons with the Bees but struggled to make an impact and thereafter drifted into non-league football and for a couple of seasons featured for AFC Wimbledon as they marched through the lower leagues. Summary: 5/0. Won 1, Drew 1, Lost 3.